David Prioletti, SIOR, has been awarded the 2018 Richard G. Levy President’s Award by the SIOR Chicago Chapter. 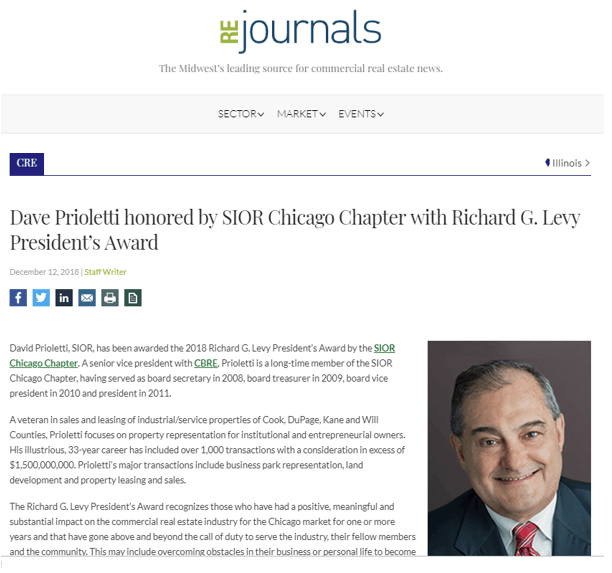 A senior vice president with CBRE, Prioletti is a long-time member of the SIOR Chicago Chapter, having served as board secretary in 2008, board treasurer in 2009, board vice president in 2010 and president in 2011. A veteran in sales and leasing of industrial/service properties of Cook, DuPage, Kane and Will Counties, Prioletti focuses on property representation for institutional and entrepreneurial owners. His illustrious, 33-year career has included over 1,000 transactions with a consideration in excess of $1,500,000,000. Prioletti’s major transactions include business park representation, land development and property leasing and sales. The Richard G. Levy President’s Award recognizes those who have had a positive, meaningful and substantial impact on the commercial real estate industry for the Chicago market for one or more years and that have gone above and beyond the call of duty to serve the industry, their fellow members and the community. This may include overcoming obstacles in their business or personal life to become successful, bringing attention to the commercial industry, helping pass legislation affecting the commercial real estate industry or gaining visibility for themselves or their business as it relates to the industry. Read the full article in REJournals here.